Nauru, the world’s smallest island state, located in the Equatorial Pacific, has again catapulted onto the international trading scene. US officials have almost completed their vetting of up to 1,250 refugees, a deal brokered between President Obama’s administration and the Australian Turnbull Liberal Coalition. Under the deal—a “dumb deal” President Trump later Tweeted, while at the time begrudgingly agreeing to honor it—the United States will take a cohort of migrants, certified as refugees in Nauru and Papua New Guinea (PNG), in exchange for a reciprocal arrangement whereby Australia will resettle Central American refugees processed in Costa Rica. These sorts of outlandish human swaps have become popular the world over, all the more so as the idea of refugees and asylum seekers has become fixated with a discourse of populist hostility. Whereas in the United States it is the buzzword “undocumented” that elicits the public outcry, in Australia it is “boat people” that attracts xenophobic scares; both are stirred by political fearmongering. “We will decide who comes to this country and the circumstances in which they come,” boomed Australian Prime Minister John Howard’s legendary refrain in 2001 when cutting the ribbon on Nauru as one of Australia’s refugee processing outposts. Howard portended the right-wing populism that later burst outside the Antipodes. Trump’s pronouncement that “we must protect our borders from the ravages of other countries making our products, stealing our companies and destroying our jobs” crystallizes such xenophobic, and often racist, scapegoating ideologies. In this climate, some governments have outsourced refugee processing and resettlement into new sites far beyond their borders. On Nauru lies one of two major Australian-built centers designed to process migrants as refugees. 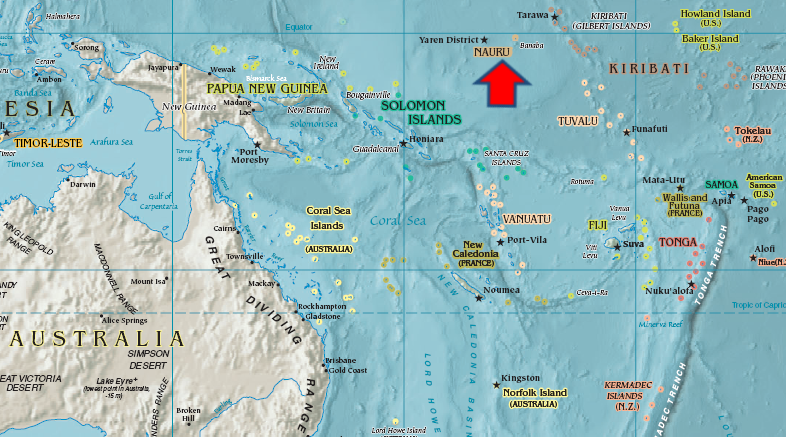 Anyone who makes their way by boat to Australia and puts forward an asylum claim is sent to Nauru, and until recently also PNG’s Manus Island, for refugee status determination. The majority of people take a boat from Indonesia or Sri Lanka hailing from provenances that span Iran, Iraq, Afghanistan, and Somalia. If positively certified in Nauru by Australian and Nauruan trained officials, migrants are given a Nauru Refugee Visa for local or Cambodian resettlement. In Nauru, it is amazing the extent to which the Australian government has gone to advance a policy that appeals to its predominately rural electorate. In 2015 alone, the Nauruan government received over AU$50 million from the Australian government in addition to vast infrastructural development projects, from a new hospital and courthouse to the reinvigoration of bygone government departments and local training in refugee legislation and determination. Thirty-one percent of the local population is now employed in refugee labor forces, easily overtaking the country’s beleaguered phosphate industry. Nauru has become something of a refugee company town in miniature, designed to appease Antipodean moral panics. In fact, Nauru is more popularly known for the Guardian’s Nauru Leaks campaign, which exploded onto the global media stage last summer. 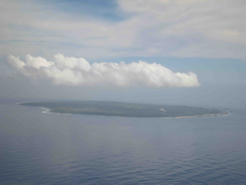 With a catalogue of over 2,000 filed incident reports, Nauru’s offshore refugee operations were characterized as an exceptionality, “a dark, wretched Truman Show without the cameras,” a “gulag archipelago” rife with “horrible mistreatment,” “squalor,” “trauma and self-harm.” Media outlets and spokespeople around the world took up this narrative, stressing the brutal conditions for refugees through discourses of suffering, persecution, and vulnerability. The reality, I found in my fieldwork in Nauru, is really quite different. Behind these mythologies, excessive expenditures keep the operations going to produce a spectacle of border enforcement. In reality, many of the same bureaucracies, organizations, and individuals contracted into refugee work in Brisbane, Canberra, Melbourne, and Sydney (refugee determination case officers, tribunal judges, social workers, legal prosecution and defence firms, clinicians, and more) found lucrative contracts on Nauru in what was referred to me as a “mundane” tendering process. Fly-in fly-out workforces of United Nations, Red Cross, and international oversight bodies all help regulate Nauru to almost farcical extent. Incredibly, beneath the vast flows of capital, the numbers of migrants processed are minute: Between September 2013 and March 2016, a slim 1,355 people were sent to Nauru for “mainland-style” processing. Nor are Australia’s maritime arrivals substantial compared to cross-border movements elsewhere. In 2011, during a peak season in which there were 4,565 boat arrivals, over 100,000 migrants arrived in Yemen from Somalia outside of formal visa channels. In reality, only a small percentage of the world’s international migrants are outside of regulatory systems, and most of them are visa over-stayers—backpackers and so forth. As with practices of border control in other states, Nauru is a farcical spectacle of enforcement for a riled public fed with supremacist myths of invasion. 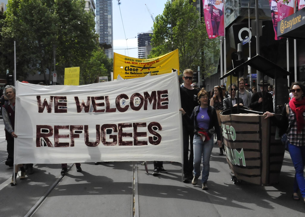 But Australia also has a strong middle-class #RefugeeWelcome movement, for whom the refugees in Nauru have become a matter of activist action. Refugee activist campaigns use tropes of vulnerability and Taliban persecution to galvanize public sympathy and bring refugees in Nauru to the mainland. But it is a woefully misguided endeavor that faces a brick wall of right-wing contempt. #RefugeeWelcome campaigns use salvational words like “refugee suffering” and “refugee empowerment” that are tainted by populist fear and compassion fatigue. Photogenic images of migrant hordes battling across stormy seas or tearing through razor wired borders contribute to the crisis imaginaries that induce public scares, inevitably leading to support for outsourced forms of regional cooperation. Certainly, under Malcolm Turnbull, the Australian government has winded down Nauru’s regional processing project. Boat turnbacks attempt to create something of a maritime fortress, as do yet more rigorous checks in airports prior to arrival. For Nauru’s new populations, the future is uncertain. The US trade deal is only for a total of 1,250 refugees from Nauru and Manus, where reside over double that number. For those who do not hold promotional appeal—think single, adult, and male—futures are all the hazier. The deal has also very recently been in jeopardy, largely owing to similar fearmongering refugee scares. Turnbull, on the other hand, has announced that in the future Nauru will take on a permanent place as a remote processing outpost in the regional deterrence frontier. 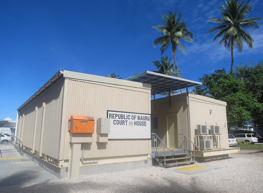 In May 2017, with the imminent closure of the Manus processing centers following a PNG Supreme Court ruling, Nauru’s Minister David Adeang said that there was extra capacity at Nauru’s processing sites, extending the invitation to PNG’s refugees. The use of Nauru as a place to outsource, process, classify, and sort refugees is the wave of the future. Posing as a migration management solution, it does little to stop human mobility desires or “protect lives at sea.” Instead, the framework of regional cooperation places people in degrading positions, circulated to far-flung locales at vast expense. As academics and activists, we need to speak out against the policies that demonize migrants, and against what is becoming the new normal: the outsourcing of refugee industrial sites. *Julia Morris is a doctoral graduate in social anthropology at the University of Oxford and a research assistant at the Oxford’s Centre on Migration, Policy and Society. She will take up a post-doctoral fellowship at the New School’s Zolberg Institute on Migration and Mobility this forthcoming academic year. She has published in Global Networks, Population, Space and Place, Space and Polity, and has contributed a chapter to Intimate Economies: Critical Perspectives on Immigration Detention (N. Hiemstra and D. Conlon, eds. ; Routledge 2016). She is completing a book manuscript on Nauru’s refugee and phosphate industries.